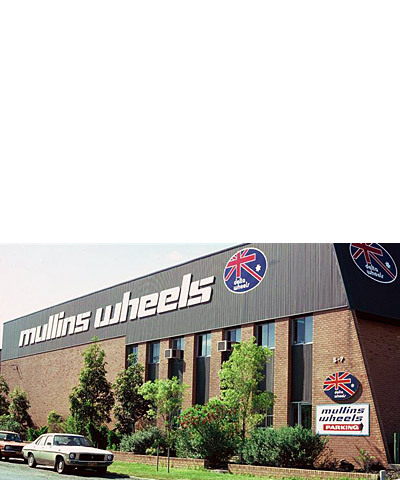 Mullins Wheels was founded wheels was founded in 1905. Since that time the Mullins wheel range has developed progressively in line with the automotive industry. Mullins current product range is extensive and Mullins Wheels are the market leader in the Australia. 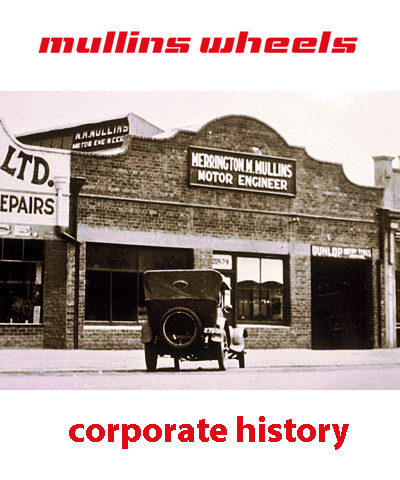 To view Mullins Wheels Corporate History in a Flash version, Click here. 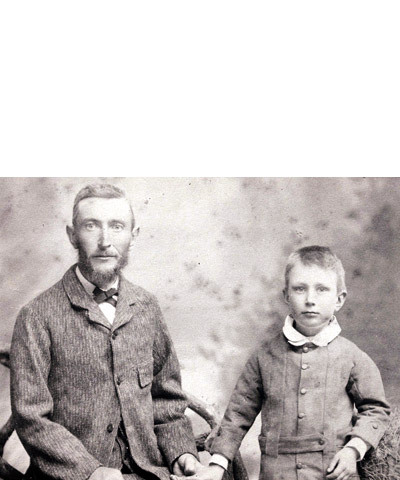 Mullins Wheels was founded wheels was founded in 1905 by Merrington M. Mullins, photographed here at age 6 with his father, who was a professional wheelwright. 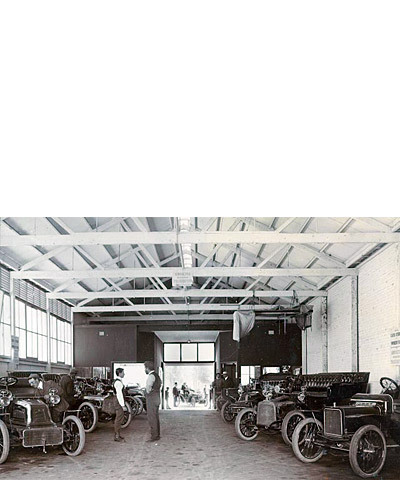 Following in his father’s footsteps, Merrington Mullins began his career in 1897 at Lewis Cycle & Motor Works. 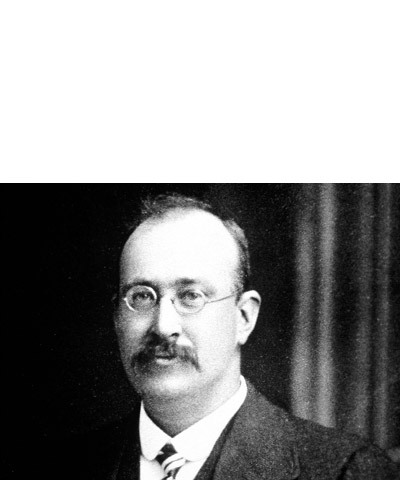 In 1900 he manufactured the wire wheels for the first petrol driven motor car built in South Australia. 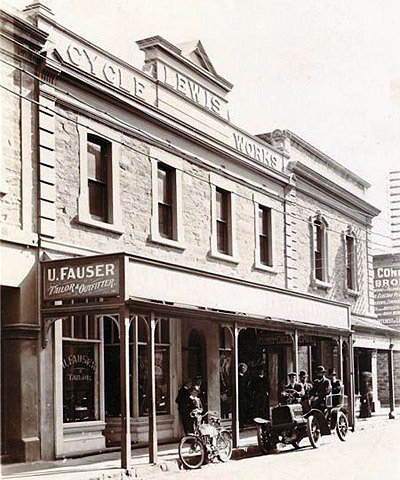 The Lewis Cycle & Motor Works was located at Freeman Street, Gawler Place Adelaide. The building figured prominently in the early days in the Adelaide landscape. As the business expanded, Lewis also split off their growing motor business to new premises called The Motor House on Victoria Square. The Motor House proper was a showroom for cars and motorcycles. 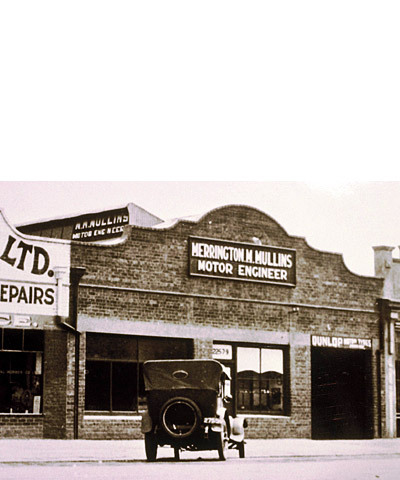 In 1905 Merrington Mullins M. Mullins established his own motor repair and engineering business in Wyatt Street Adelaide. In these early days most replacement components had to be manufactured as required, before the vehicle could be repaired. In 1920 M.M. Mullins purchased larger premises at 225 Pulteney Street, Adelaide to accommodate his growing business. In the 1920’s many vehicles fitted with solid rubber or high pressure tyres, were found to have limitations when travelling over the rough, unmade, often sandy roads prevalent at the time. 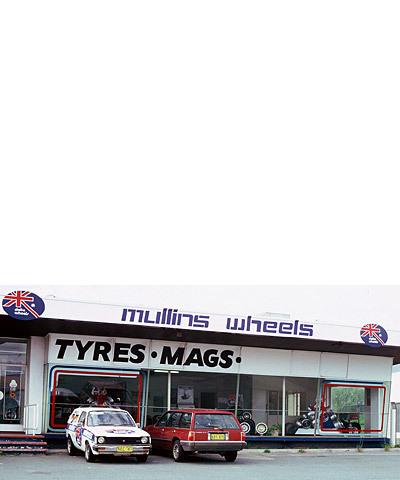 Mullins Wheels began to specialise in the fitment of pneumatic, balloon low pressure tyres to various vehicles to achieve flotation and improved tyre life. This generally involved fitment of smaller diameter rims and rebuilding of wire, wooden or steel disc wheels. This was an enterprise for which Mullins Wheels became well known. 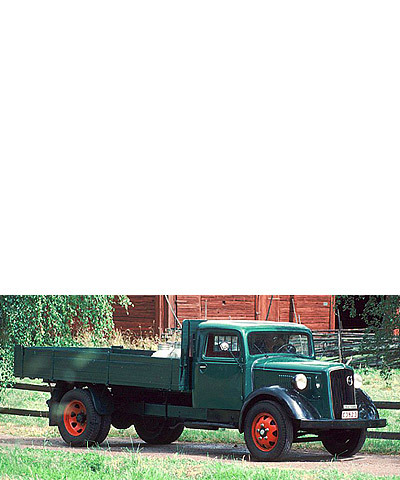 From the mid 1920s Mullins Wheels also pioneered the conversion of trucks, tractors and agricultural machinery equipped with solid rubber tyres, to pneumatic tyres and wheels. From about 1935 onwards the Company specialised in conversion of steel wheeled machines, promoting the use of wider rim widths to achieve improved traction and performance. 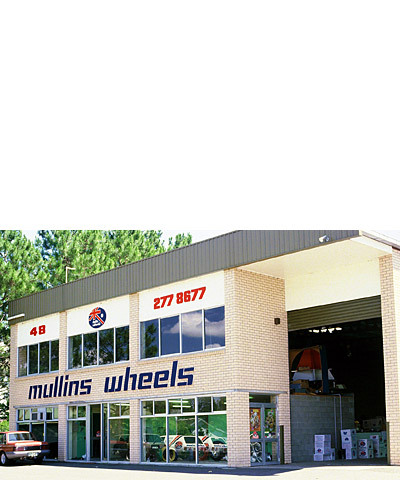 In 1970, Mullins Wheels Pty Ltd opened a Branch Office and warehouse in Silverwater, Sydney. 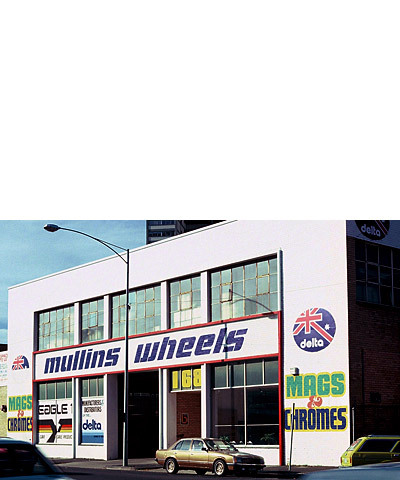 In 1970 Mullins purchased Austral Motor Wheel Works in Macaulay Rd North Melbourne and converted this into their Melbourne Branch. 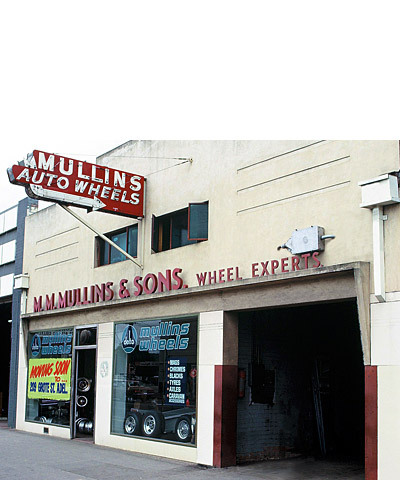 In the early 1970’s Mullins opened a branch office and warehouse at Great Eastern Hwy, Redcliffe WA. This rapid increase in requirements led the Company, in 1975, to relocate its Head Office and manufacturing facility to 209 Grote Street, Adelaide, still within one kilometre from the Adelaide G.P.O. Expansion continued during the 1980s. 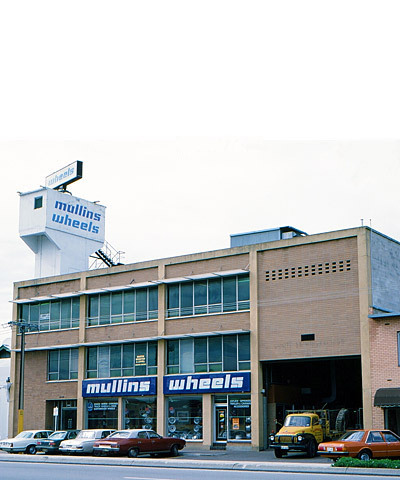 In May 1982, Mullins Wheels opened a branch office and warehouse in Brisbane giving the company a unique and complete National Branch network and in October 1984 Mullins Wheels Pty. Ltd. commissioned an aluminium foundry at Mile End in Adelaide, S.A. to facilitate the further production of alloy wheels. 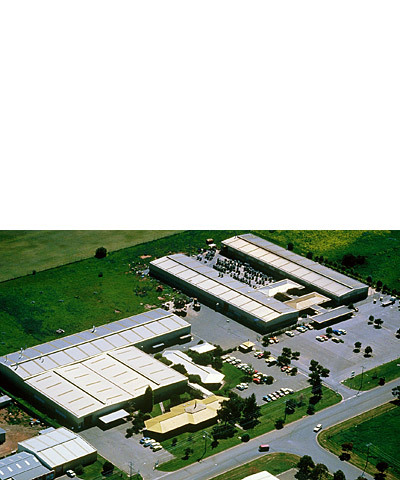 Mullins Wheels purchased CSA Alloy Wheels in September 1986, adding the CSA, Globe and Magnum brands to the existing Delta product range and in January 1987 Mullins relocated their manufacturing centres, head office and distribution centre, to a new 14 acre site at Salisbury, South Australia.